Hip/Knee Equipment Kit: Hip/Knee Equipment Kit. Includes Four Household, Dressing And Bathing Items For Clients Recovering From Hip And Knee Surgery. 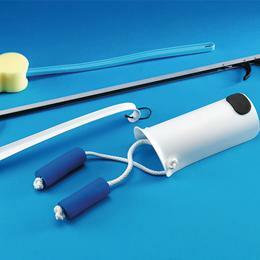 Kit Comes In Plastic Bag And Includes: Sammons Preston Rolyan 32" (81Cm)-Long Reacher C4107 Or 26" (66Cm) Reacher Sock Aid With Foam Handle Plastic 161/4" (41Cm) Shoehorn Bendable Contoured 18" (46Cm)-Handled Sponge. Latex Free. Kit With 26" (C4109) Reacher.